2015 is the 23rd Anniversary of this award. 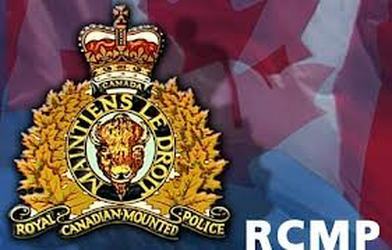 Constable Duma Norman Bernard, Eskasoni Detachment, Eskasoni First Nation, Cape Breton, Nova Scotia, has won the prestigious IODE RCMP Community Service Award, established in 1993, presented to an individual or detachment that demonstrates tireless, exemplary off-duty volunteerism. Constable Bernard is the School Safety Resource Officer in his community. While some of his work is conducted in the normal course of his duties, much is provided on a volunteer basis. There are 1,100 youth in the four schools in the community. As a member of the Eskasoni First Nation, he strives to do everything possible to improve the quality of life for the 4,000 residents of Eskasoni, the largest Mi'Kmaq community. ​In 2009, the community experienced a suicide crisis. While the RCMP and social agencies worked to address this, Constable Bernard implemented preventative measures within the schools. Within a three-day period, he delivered self-esteem workshops to 800 students. He also arranged for guest speakers to meet with the senior grades providing their own stories on being a survivor of a loved one who ended their life. To address this concern on a long term basis, he formed a multimedia youth group, which created a YouTube video and featured local youth and provided elders and elected officials discussing suicide. The video Art of Resilience was extremely powerful and everyone in the community was able to connect with its message. Constable Bernard was able to secure a provincial grant of $56,000 to purchase professional video and editing equipment for the multimedia group, which continues to create videos targeting concerns they identify. They have increased the awareness among their peers and enable a more informed approach to topics such as substance abuse and violence within relationships. In 2012, Constable Bernard took the initiative to identify high risk youth. He approaches the youth and their parents to determine whether the youth is interested in working with him. He utilizes the small number of youth to help others within the community for talks such as shovelling walkways for the Elders or delivering meals to Elders with mobility restrictions. They transport and set up music equipment for youth dances. This provides these youths with an opportunity to interact with the community on a broader scale who see the youth providing a valued service, which builds self-esteem in the participants. Constable Bernard arranged to use the high school gymnasium for gym nights twice a week. Up to 200 youth attend each night through the school year. In cooperation with the Air Canada "Dreams Take Flight" program, Constable Bernard meets with elders to identify deserving, impoverished youth who are offered a trio to Walt Disney World, Florida. Since 2009, he has been able to obtain two to four seats each year and transports the kids himself to the Halifax airport, a three-hour commute. He is also part of the "Parents Against Drugs" committee. He approached various community members who formed this committee in 2009. One of the first events he coordinated was a community march against drugs, where 800 community residents marched through Eskasoni carrying posters highlighting concerns surrounding drug abuse. The four other First Nations communities in Cape Breton contacted him and requested assistance in forming their own groups, which he did. "Operation Red Nose" provides safe transportation to people under the influence during the holiday season. Constable Bernard works tirelessly to prevent youth from making poor choices in their lives, most often on his own time and at his own expense. Clearly, his positive influence on youth has similar benefits to the community at large. 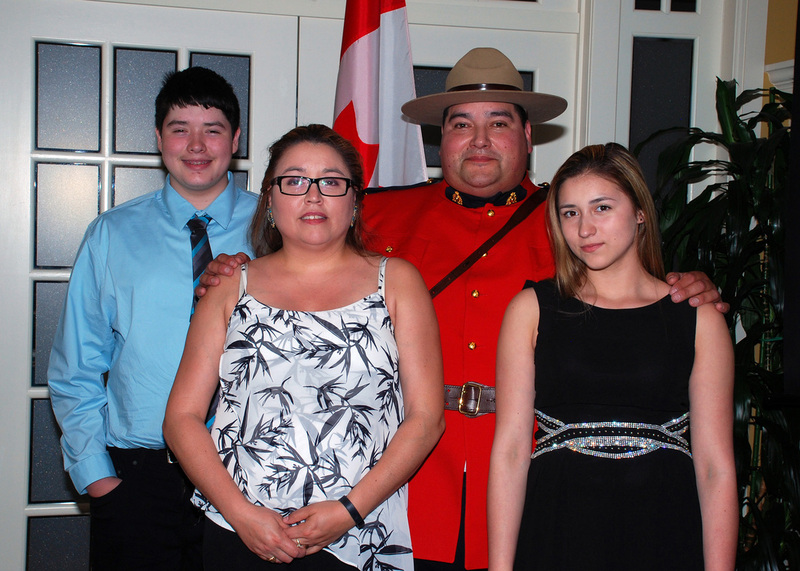 For his impressive devotion to assisting his community, both on and off duty, Constable Duma Norman Bernard is awarded the 2016 IODE RCMP Community Service Award. National President E. Anne Mason and National Citizenship Officer Ruth Ann Butler present the award to Constable Duma Norman Bernard (left), Eskasoni Detachment, Eskasoni First Nation, Cape Breton, Nova Scotia, with Assistant Commissioner Brennan participating in the ceremony. Constable Bernard's family, son DJ, wife Mag and daughter Jetta, were delighted to attend the ceremony. National Standard Bearer Sheila DeJaegher and National Citizenship Officer Ruth Ann Butler had an opportunity to speak with Assistant Commissioner Brennan following the awards ceremony. "It was an absolute pleasure for me to have attended the 2016 IODE Canada 116th National Annual Meeting and to be part of the presentation that awarded Constable Duma Bernard with this year's IODE RCMP Community Service Award." "The IODE is to be commended for all the wonderful work they do in communities across Canada and speaking for the RCMP, we are proud to be partners with the IODE in enhancing the well-being of our collective communities."